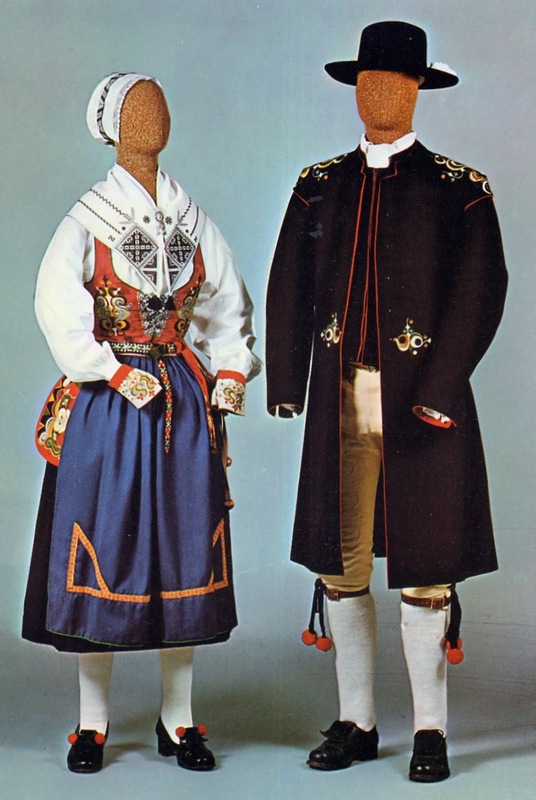 Today I will continue my series on the costume and embroidery of Leksand. 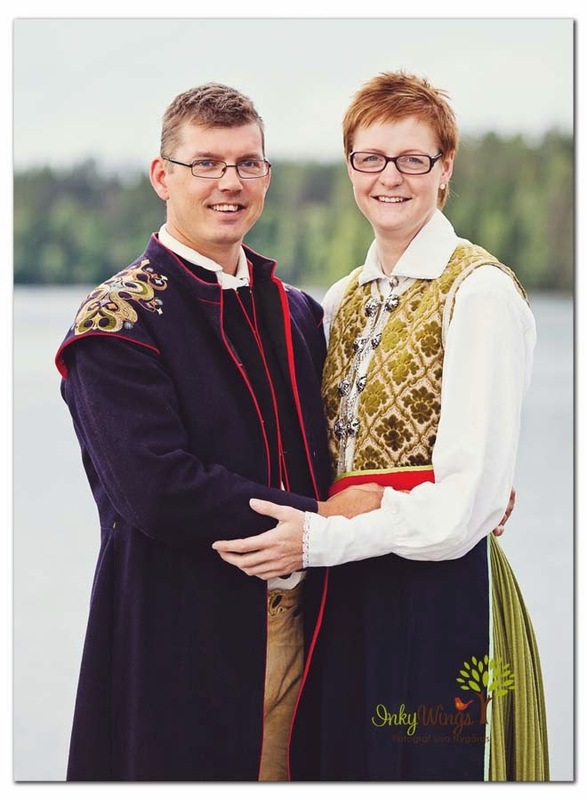 I should point out that several of the neighboring parishes in the vicinity of Lake Siljan have costume traditions equally complex and interesting, ie. 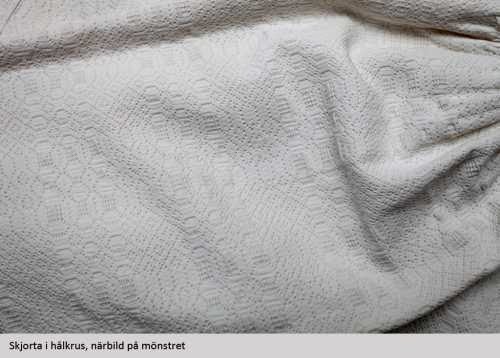 Floda, Mora, Boda, Rattvik, Gagnef, etc. 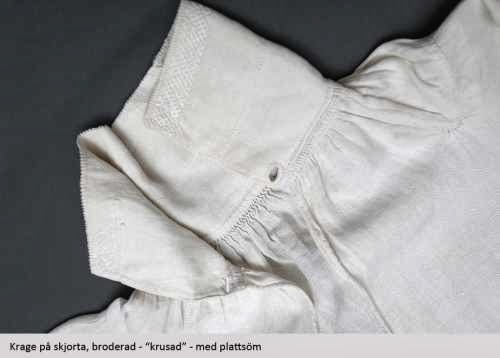 Today I will look at the mens costume and analyse the Leksand embroidery. 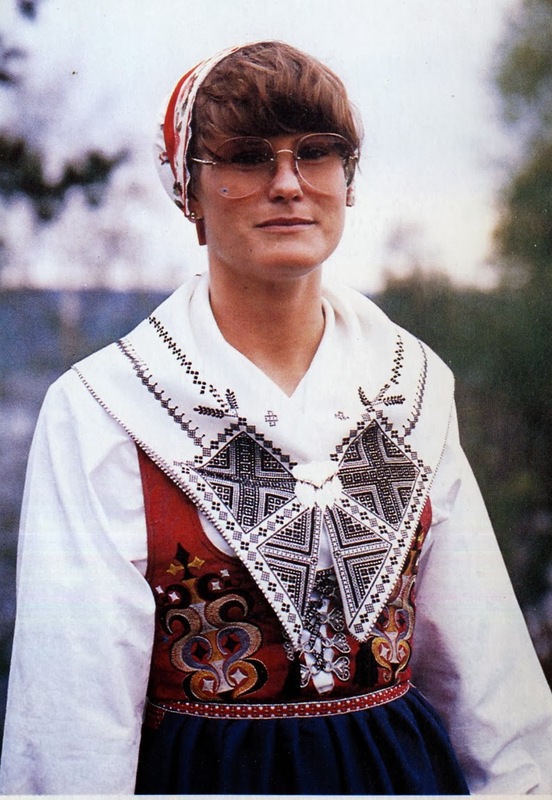 The first item of clothing is the shirt, skjorta. 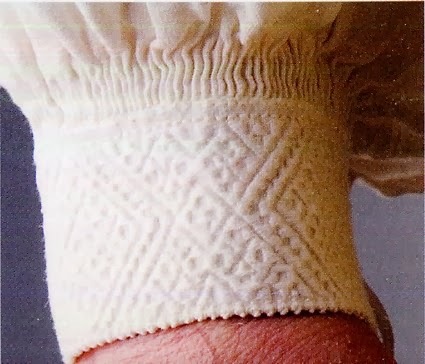 This is of white linen with a wide cuff and collar. 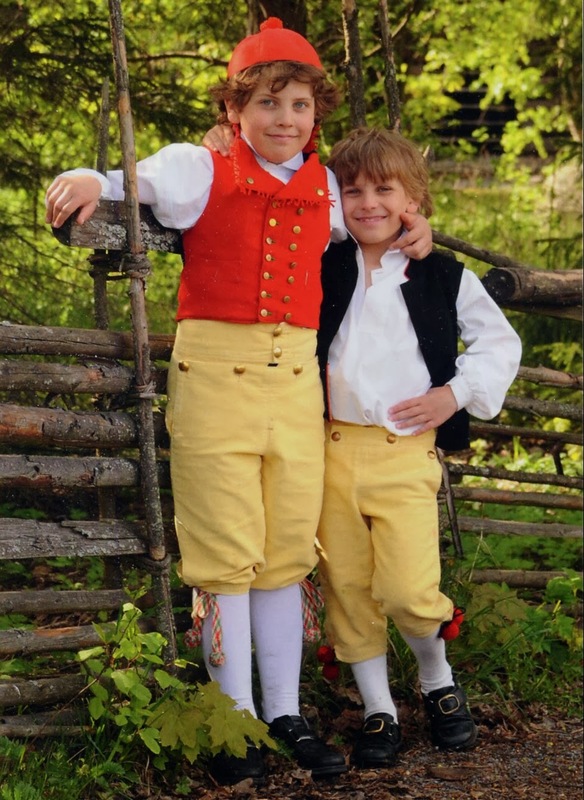 I have not found an image of one from Leksand, but here is one from the neighboring parish of Gagnef. It seems to be similar. 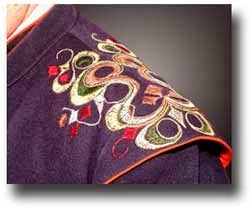 There is a wide collar with counted satin stitch embroidery and nuggor on the edge. 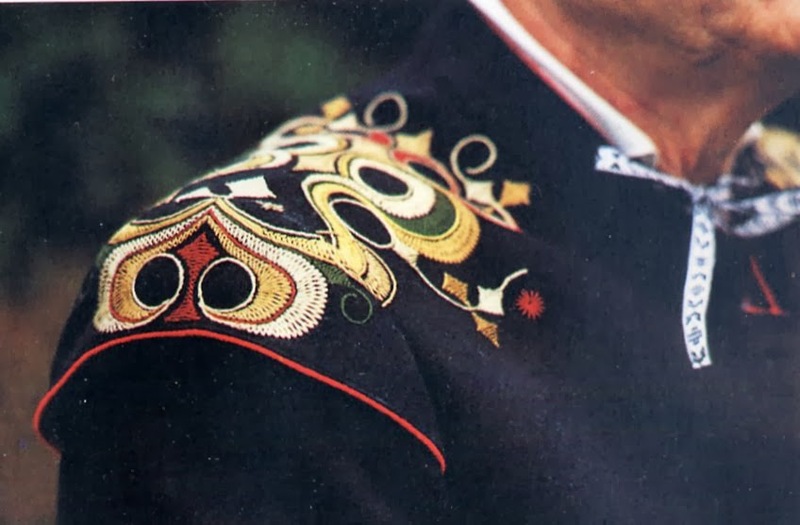 Similar embroidery is on the cuff. 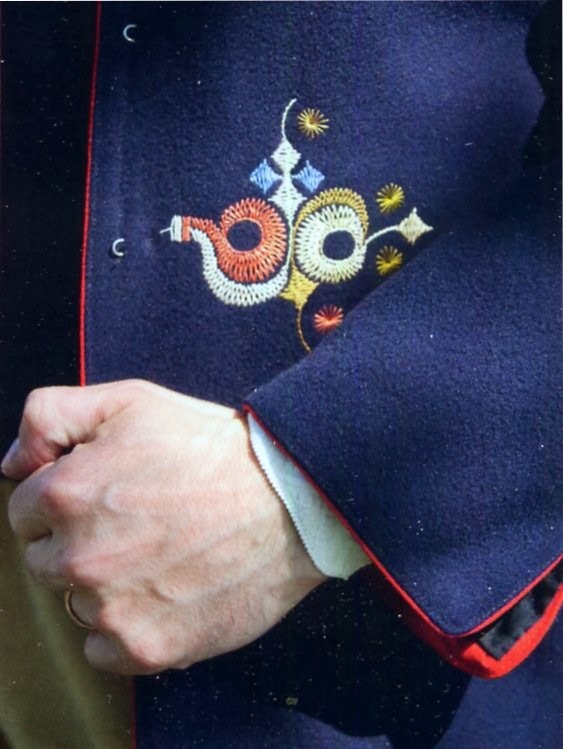 The sleeve is smocked into the cuff, and the body of the shirt is smocked into the collar. 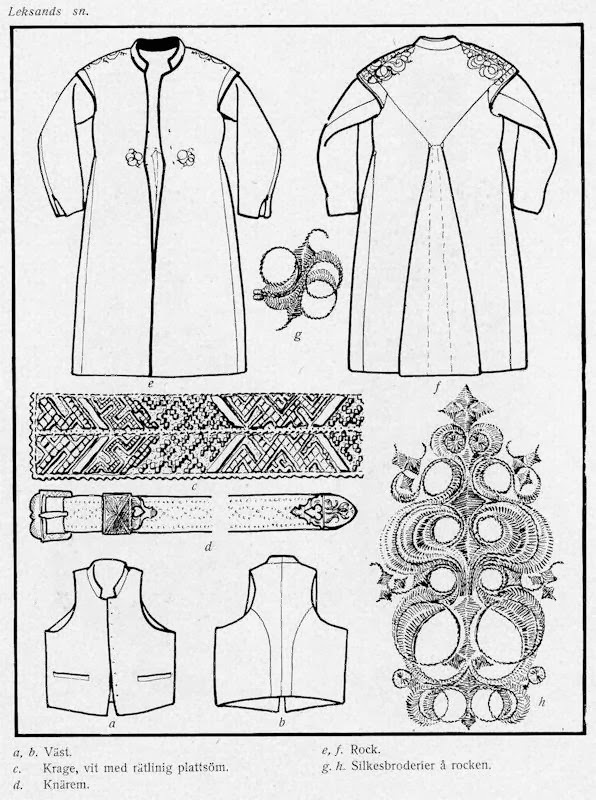 Sufficient fullness is achieved around the neck by cutting a T shape along the shoulders, turning the sides out and inserting a rectangle of linen into the opening thus created. 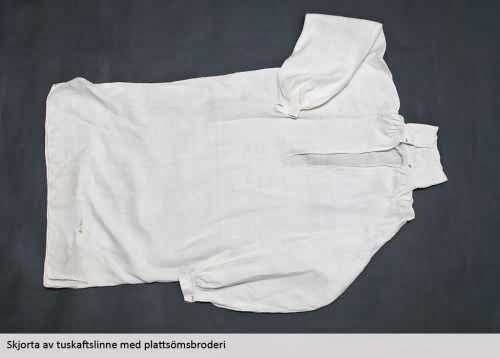 These two insets and the body of the shirt, front and back are then collectively smock-gathered into the collar. 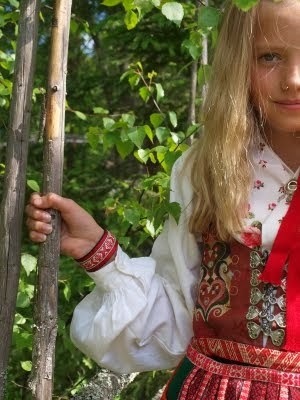 This is a cut typical of Scandinavia. 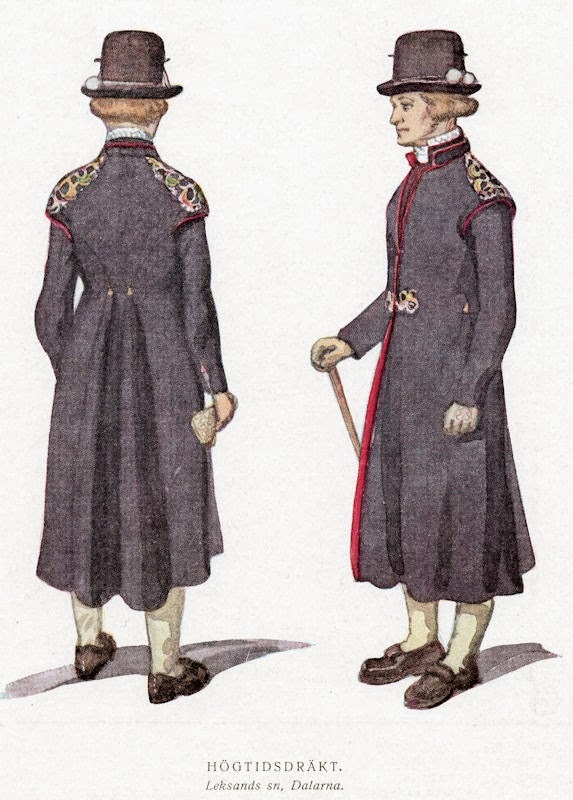 Note the buttonholes on both the collar and the cuffs. 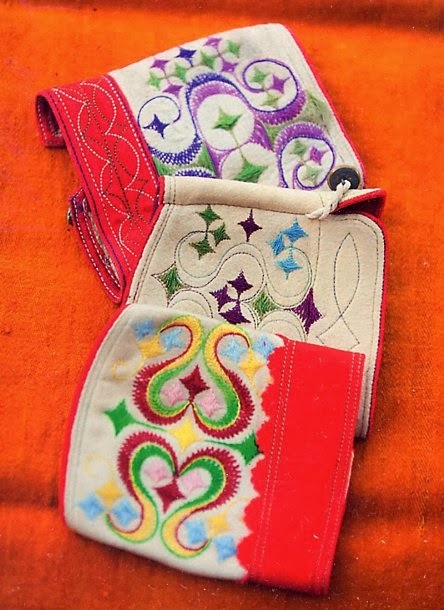 The cuffs are closed by threading a ribbon through these and tying it. 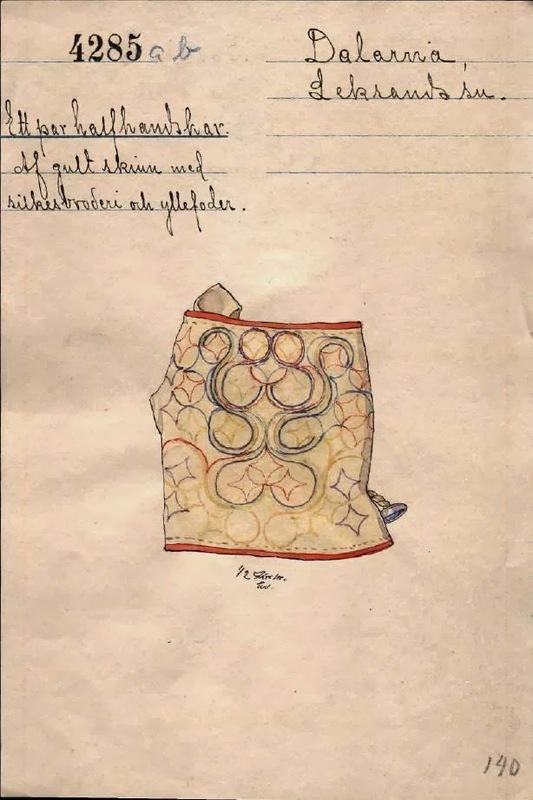 The collar likewise, or the collar may also be closed by a ring brooch as for the women. 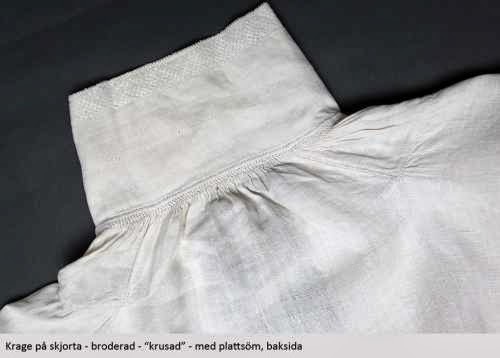 I believe that the collar in Leksand was worn turned down, so that the embroidery would be on the other side. There was undoubtedly individual variation. 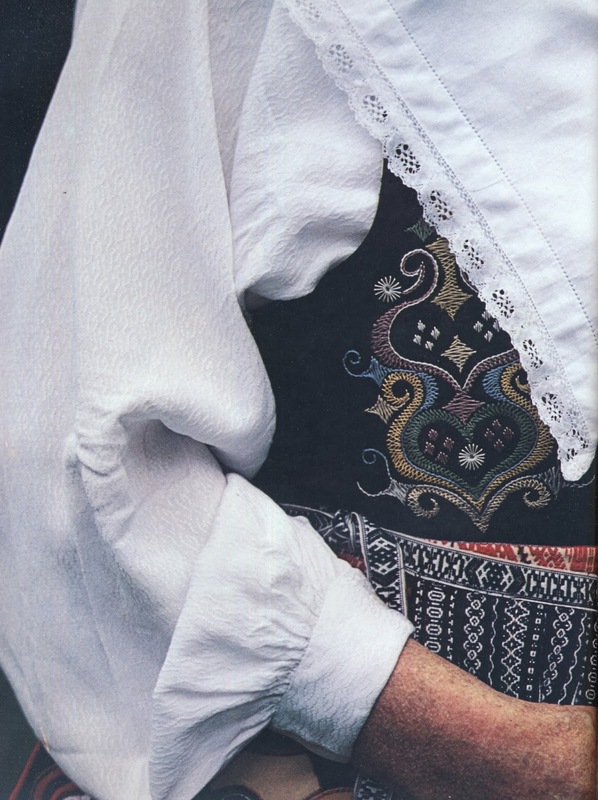 As for the women, festive shirts were sometimes made of linen with a decorative weave. 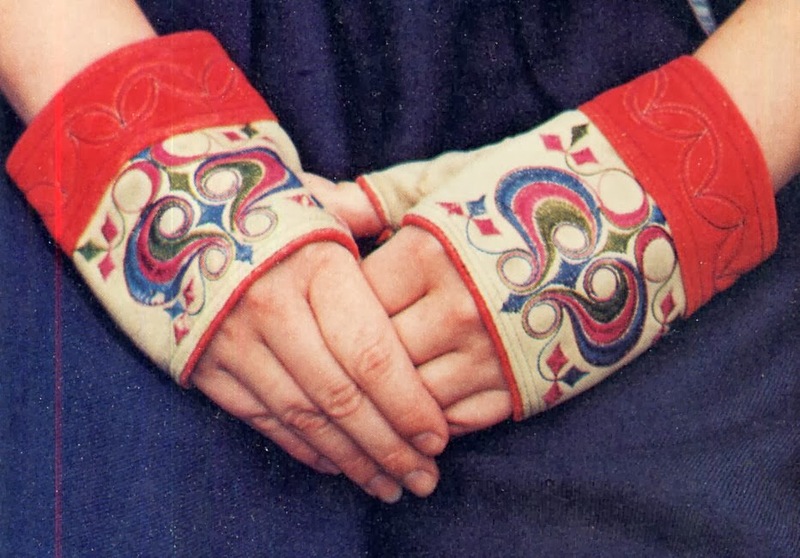 Here is an example of cuff embroidery from Leksand. You can see that it is essentially the same. 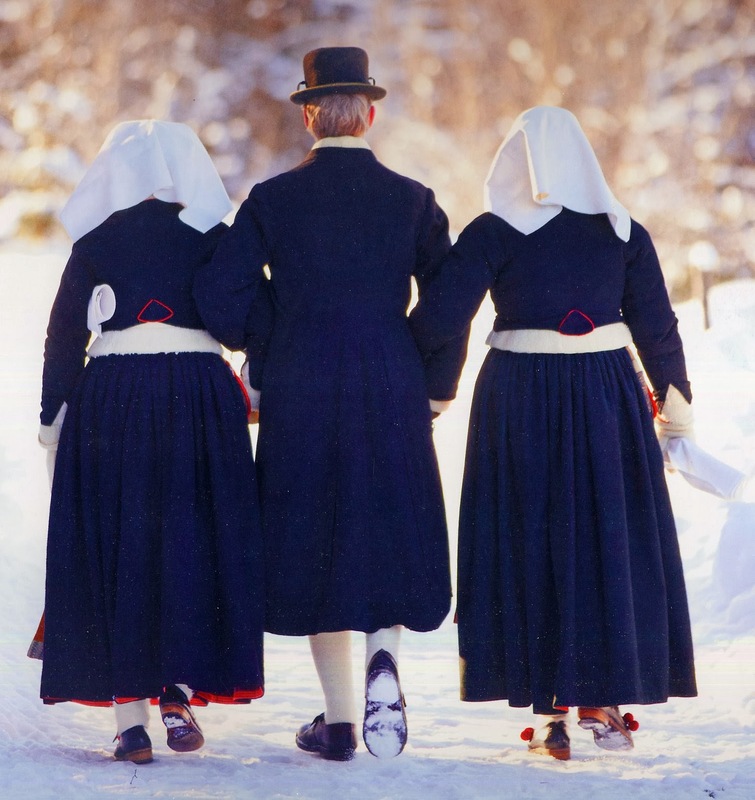 Note the white wool stockings held up by garters of black wool or leather. 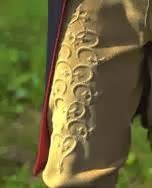 You can see some of the details more clearly in this set of breeches from the neighboring parish of Mora. This pair is in gray vadmal and is higher waisted. 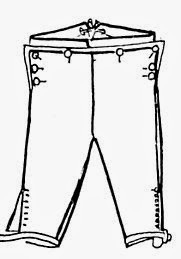 Breeches for dress occasions are embroidered, in the same way that women's chamois bodices sometimes are. 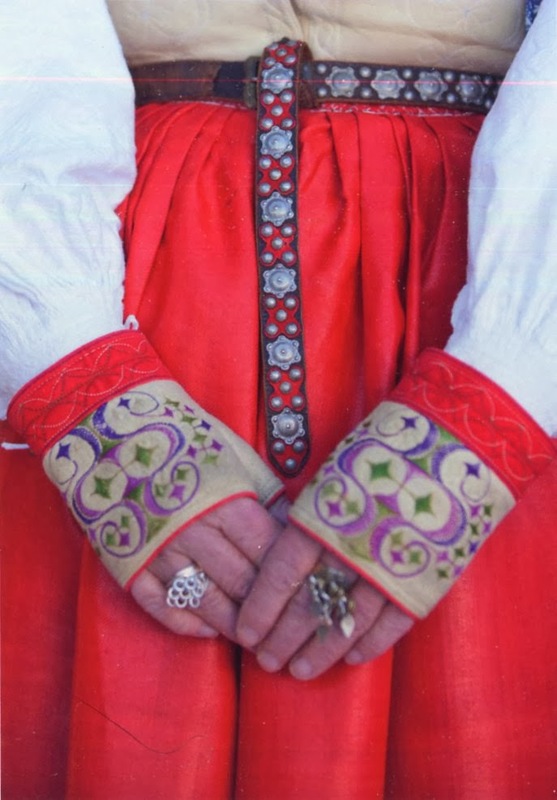 The motifs echo those of the Leksand embroidery on the outer clothing. 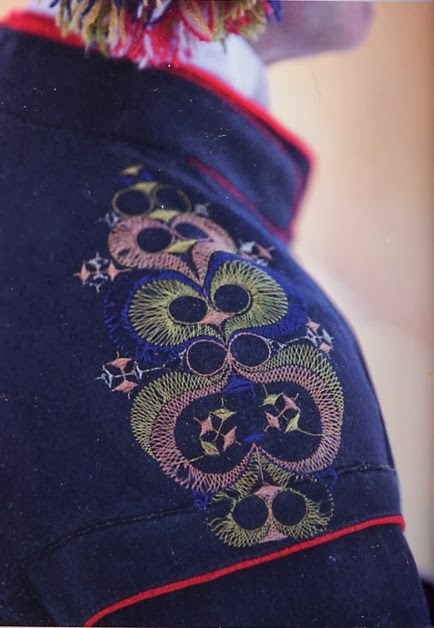 I am not sure how this embroidery is done; if anyone has an insight, I would appreciate that information. 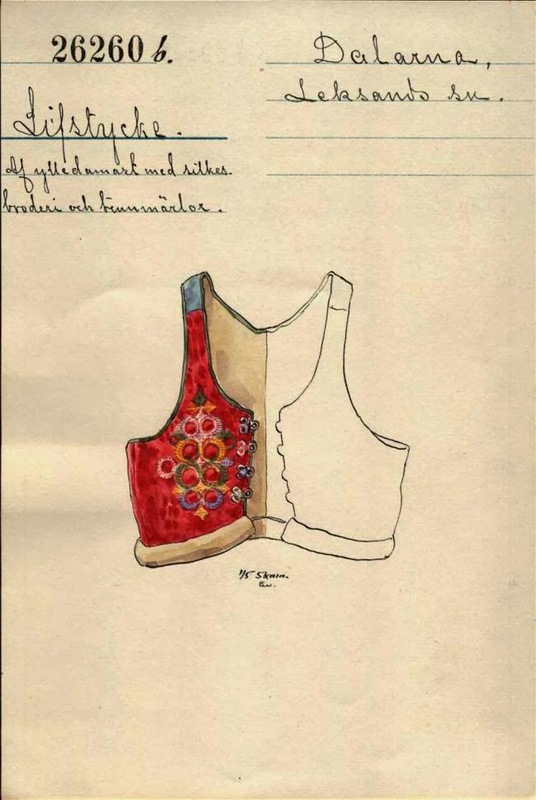 The vest, Väst or Livstycke, is of two kinds, chamois leather for everyday, and black wool for dress. 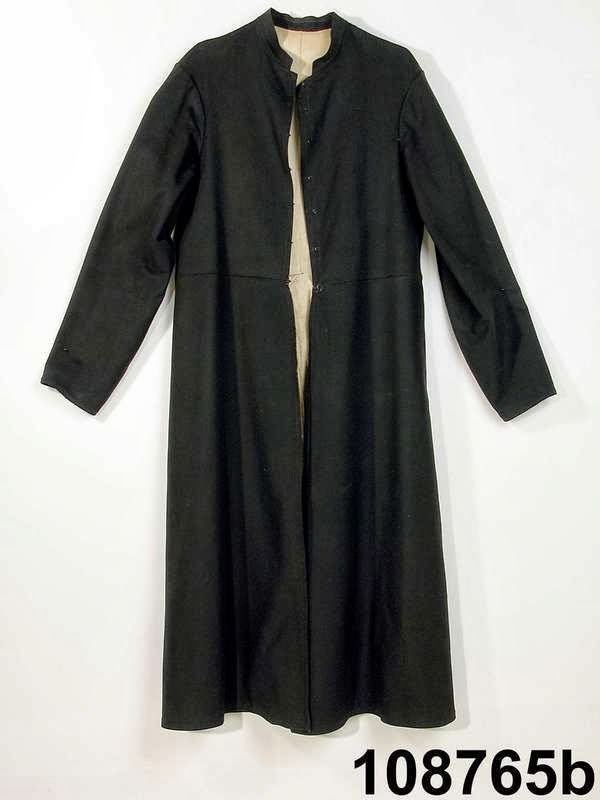 It has a standing collar, is hooked or buttoned closed down the front, and has two pocket flaps. 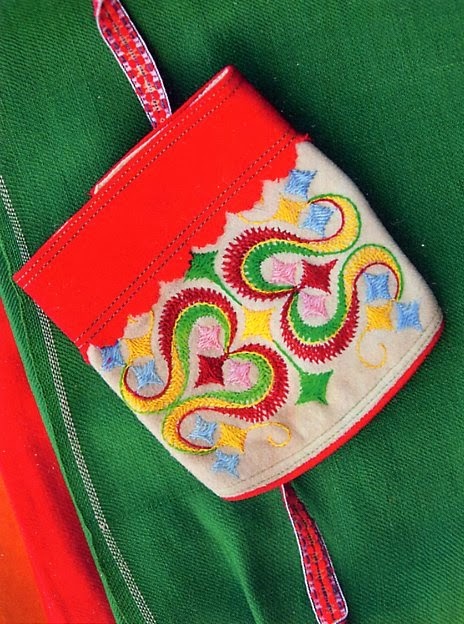 The most dressy version has red piping around the openings and pocket flaps. 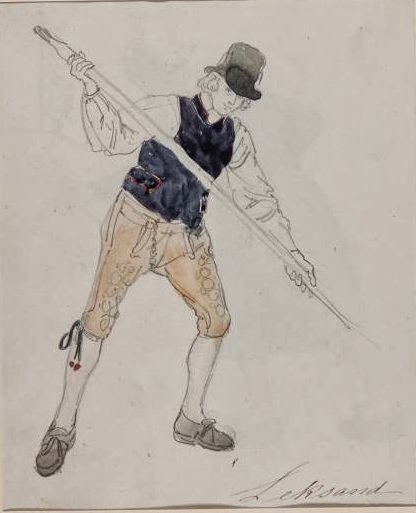 The vest is sometimes shortened under the influence of the Empire period, leaving a gap between the vest and the breeches. 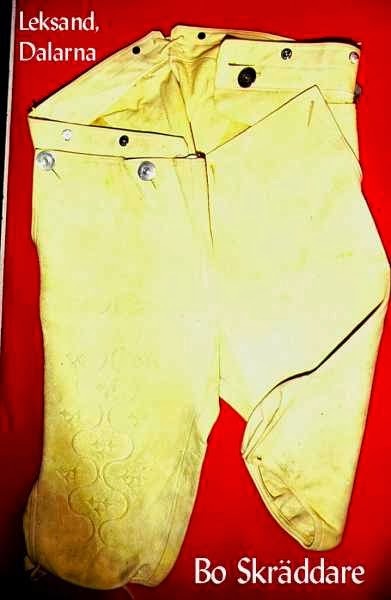 This gap may be filled with a wide leather belt, which is ornamented with embossed work. 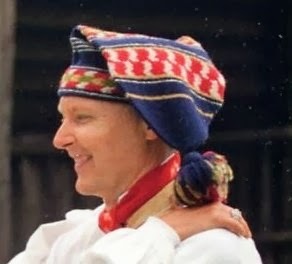 A neck kerchief, or halskläde is worn with this costume. 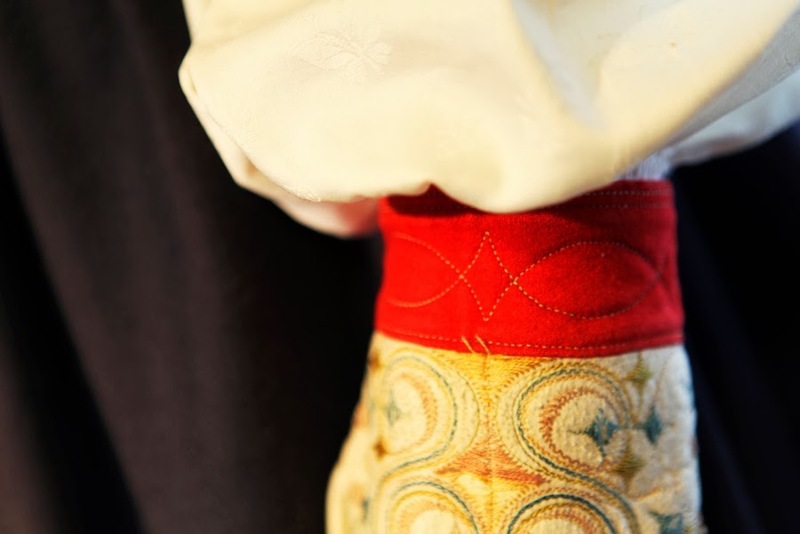 Sometimes it is a colored square, silk or otherwise, which is rolled and tied around the collar. 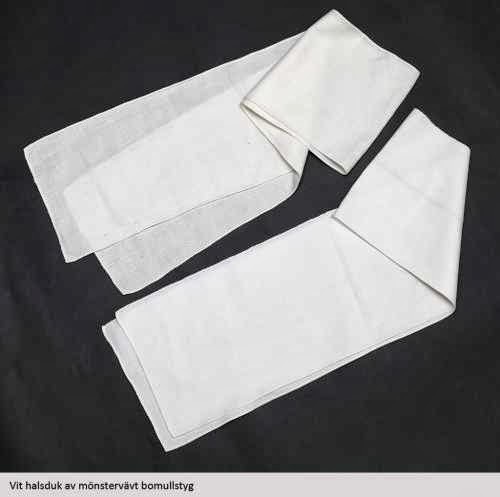 For the more formal costume they wear the långkläde, which is a length of linen about 21 x 150 cm which for wear is folded lengthwise to be about 5-6 cm wide. 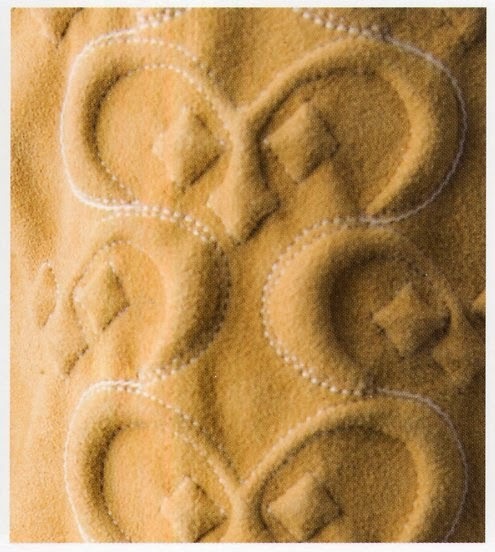 This is embroidered on each end, and may have bobbin lace attached. 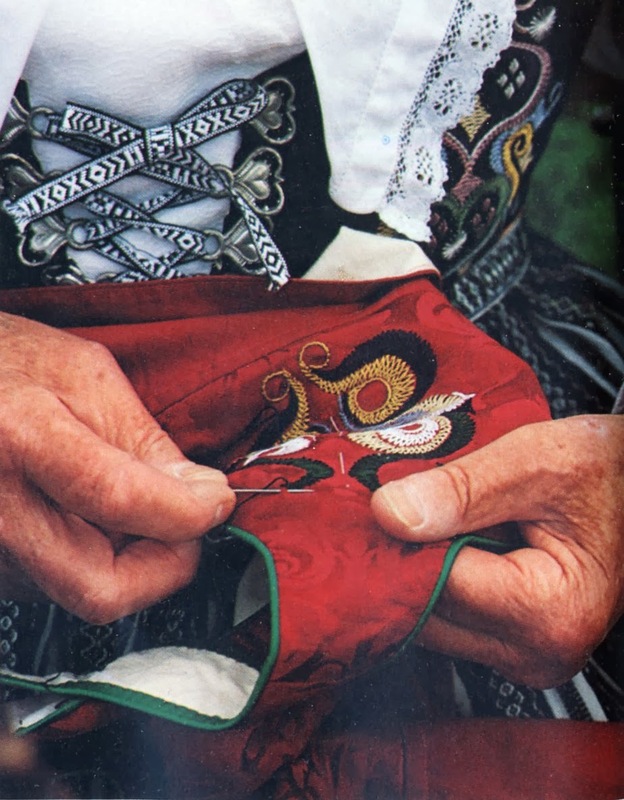 Each end is often embroidered differently, and it is tied around the neck in such a way that only one end shows, and different embroidery can be shown off at different times. 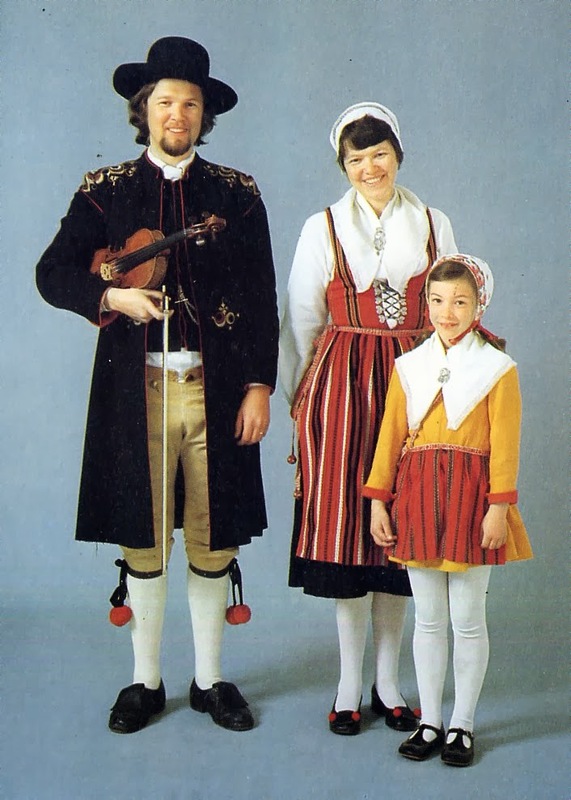 Here are examples of långkläde from the neighboring parish of Gagnef. 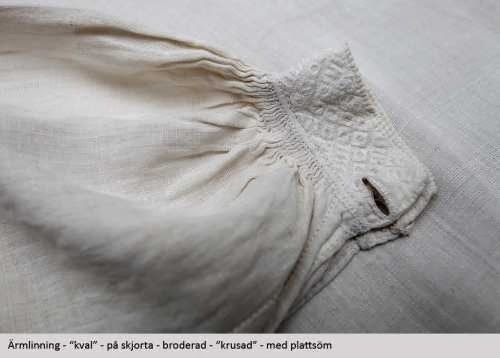 Plain white cotton and embroidered linen. 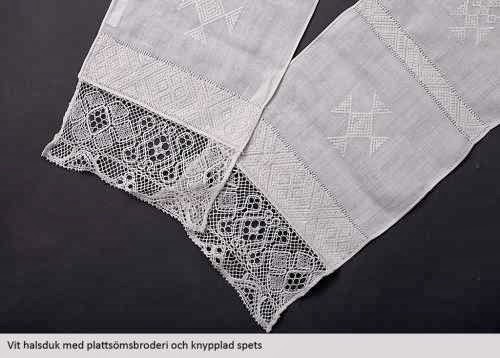 The linen embroidery and bobbin lace are of the same type as those used in Leksand. 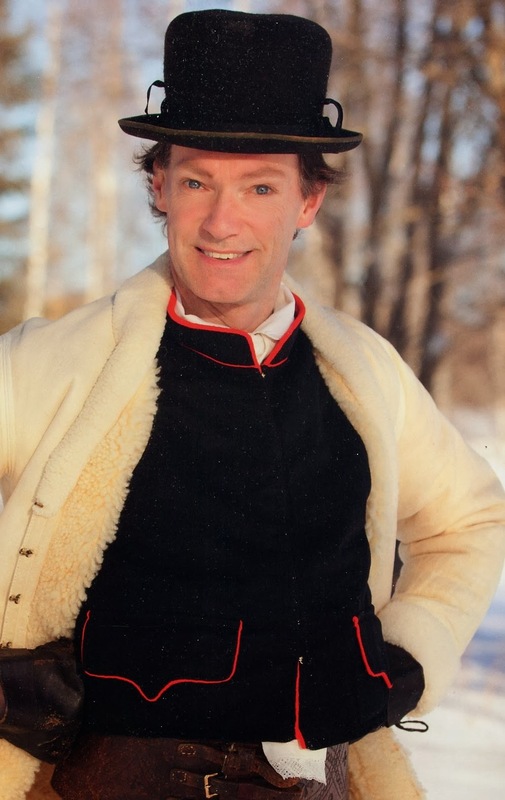 There are three kinds of hats worn with this costume. 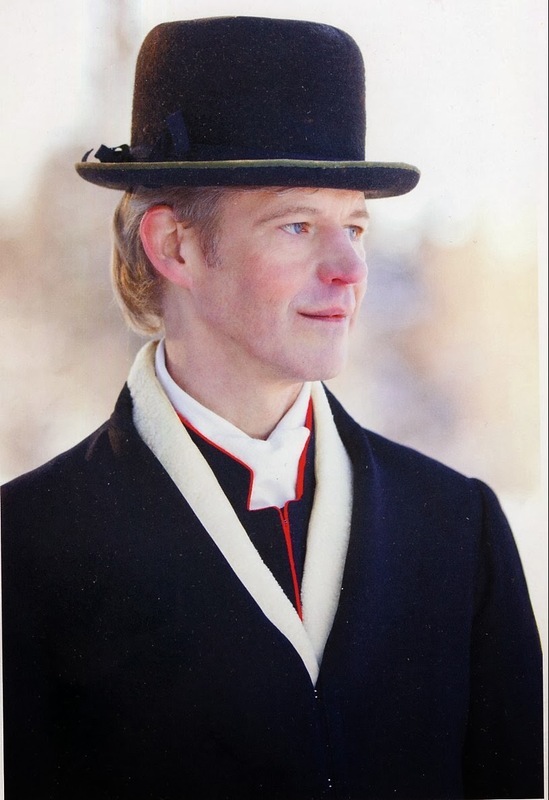 For everyday, a knitted stocking cap or a peaked cap, and for festive occasions, a felt hat. 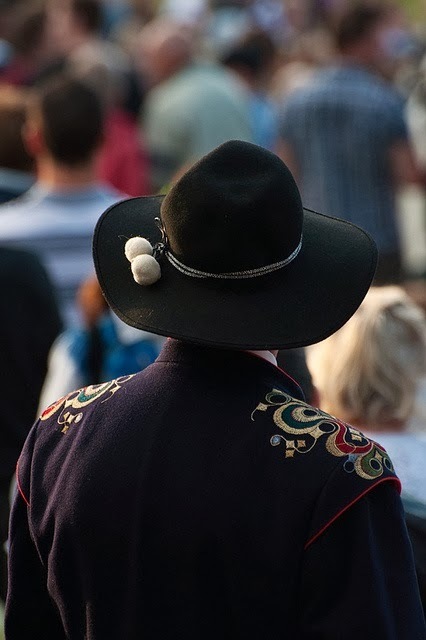 This is also worn on the way to and from Church; like all Christian laymen, a hat is never worn in Church. 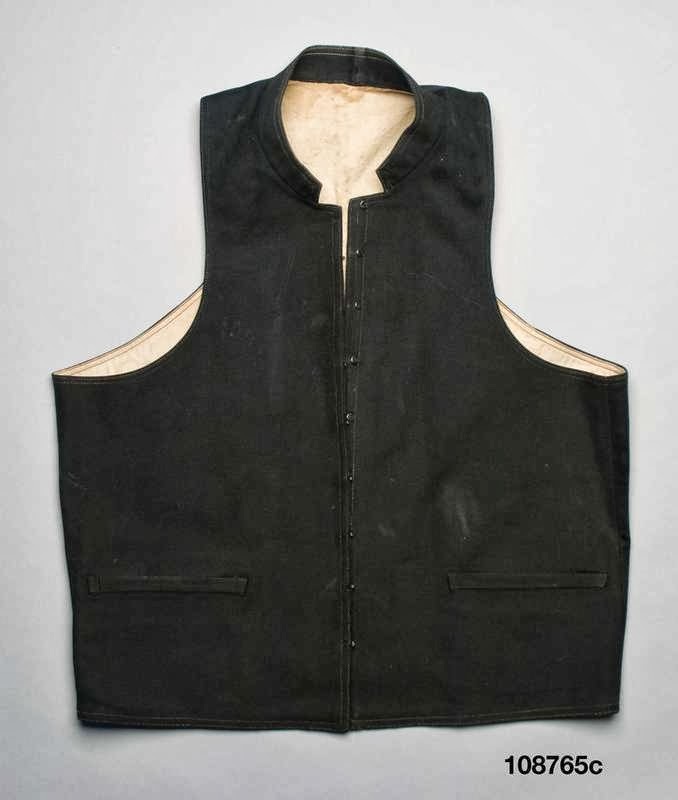 For everyday, a leather apron with a bib is often worn. 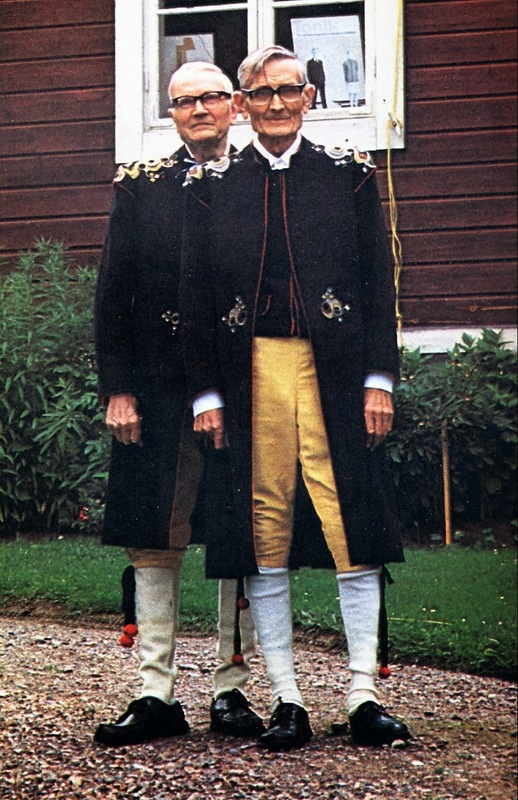 This is called förskinn, meaning front leather. 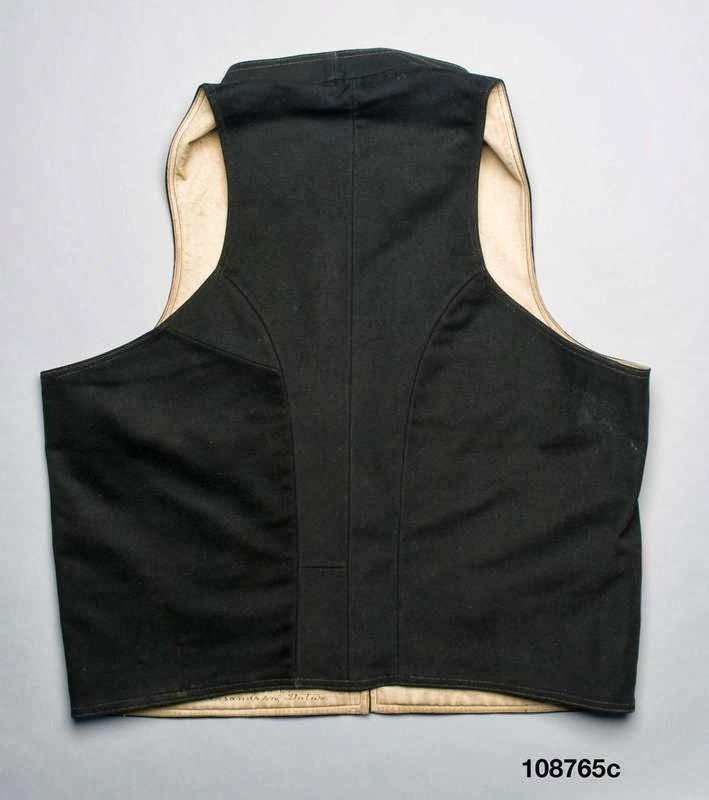 This has a belt which secures the apron around the waist. 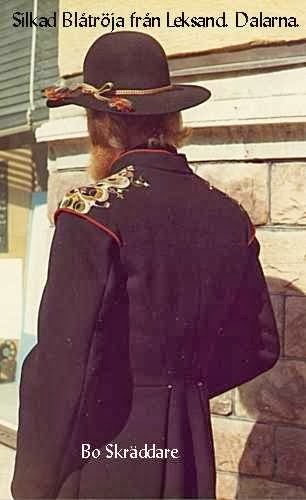 There are three kinds of 'jackets', 'troje' worn with this costume. 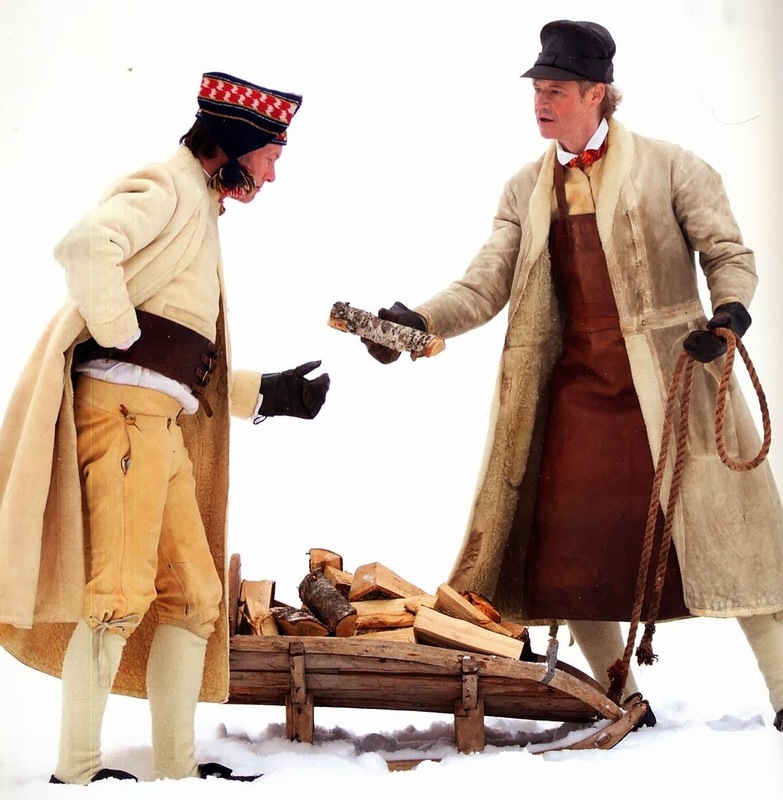 There is the long sheepskin jacket shown here above, which is worn in cold weather. 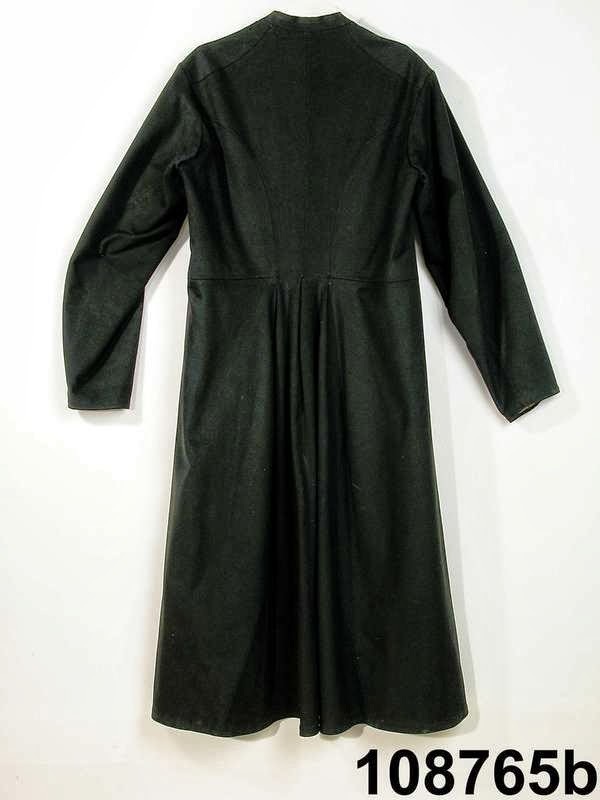 There is a long plain black wool jacket 'svarttroje' which is worn to Church, sometimes over the sheepskin jacket, if warmth is needed. 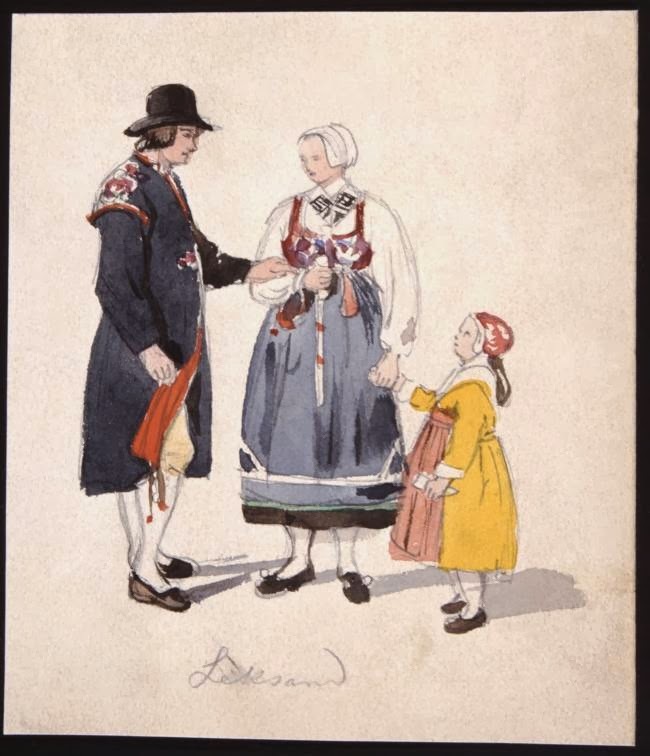 Here is a man going to a funeral, which is indicated by the women's costumes. The man's costume just tells us he is going to Church. 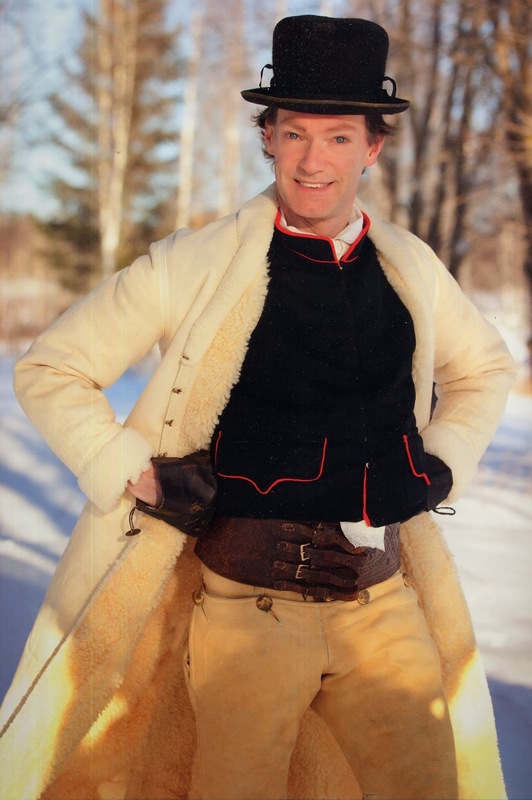 Here is the cut of both the jackets and the vest. 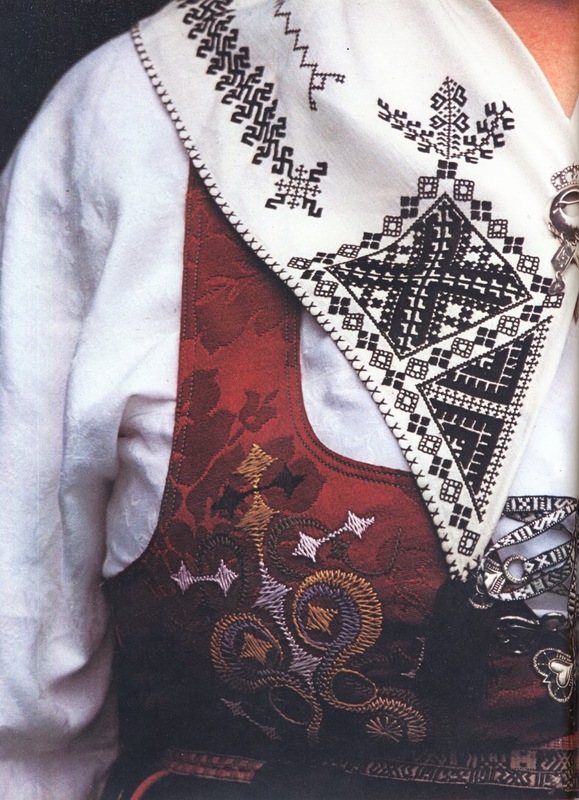 This also shows the garters and gives embroidery patterns for the shirt and jacket. 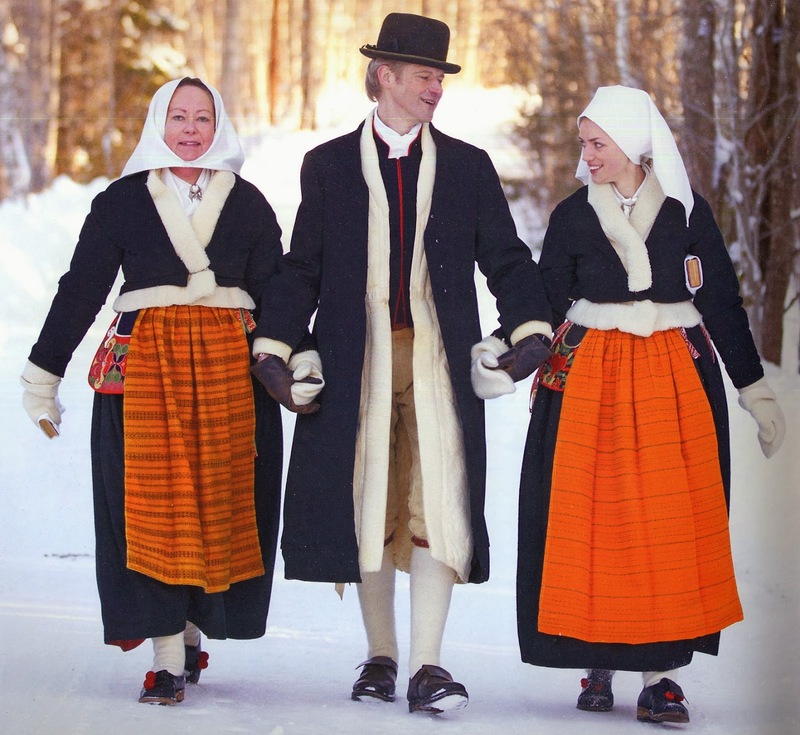 The most distinctive jacket worn with this costume is the festive jacket, the blåtroja. This means 'blue jacket', and it is supposed to be a midnight blue in color, although it sometimes appears black. 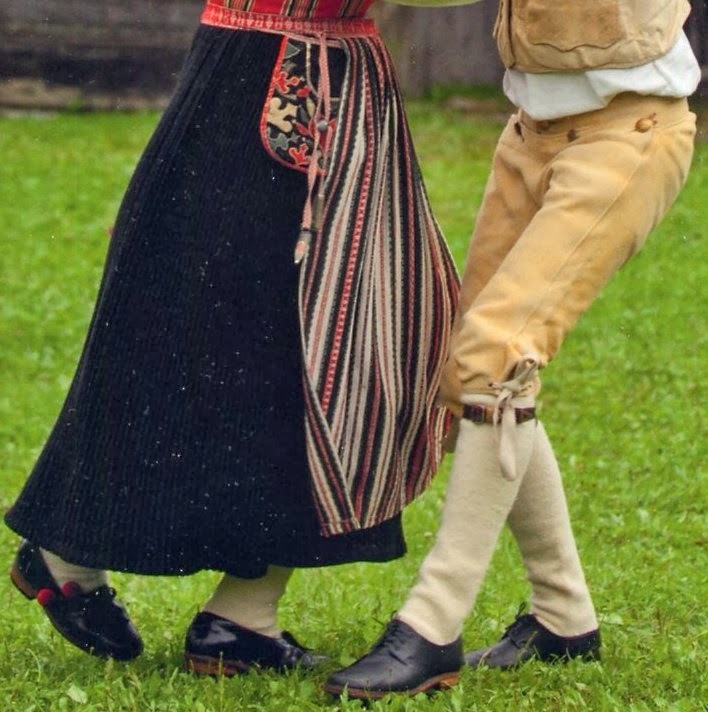 This image shows a man in Leksand costume with a woman in Skåne costume. 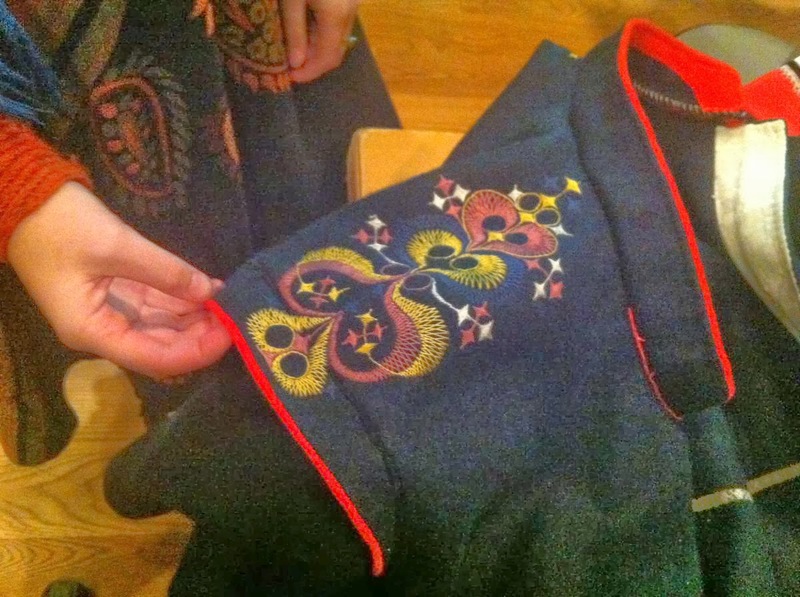 This has a hook closure down the front, red piping around the openings and a separate shoulder cap. 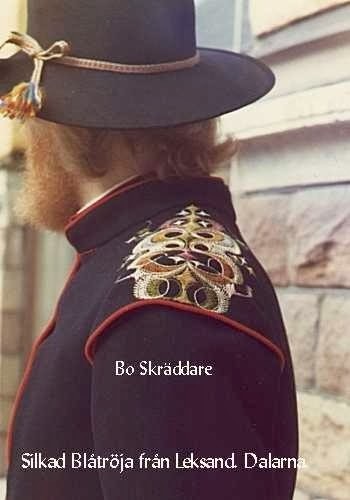 It also features the typical Leksand embroidery on the shoulders, which extends onto the shoulder cap, and on the front waistline. 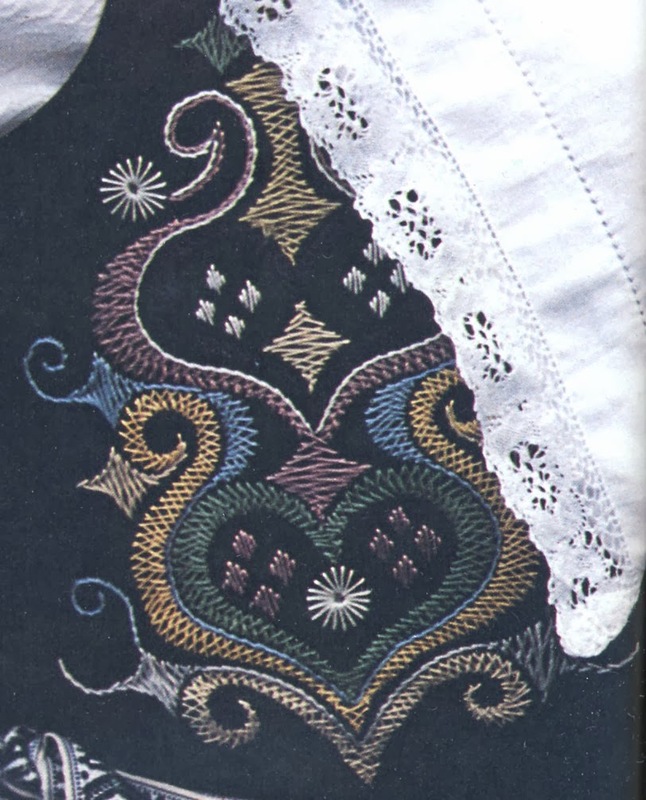 The shoulder embroidery is the same as that on the women's bodice, but the waist embroidery, while executed in the same technique, is asymmetrical. 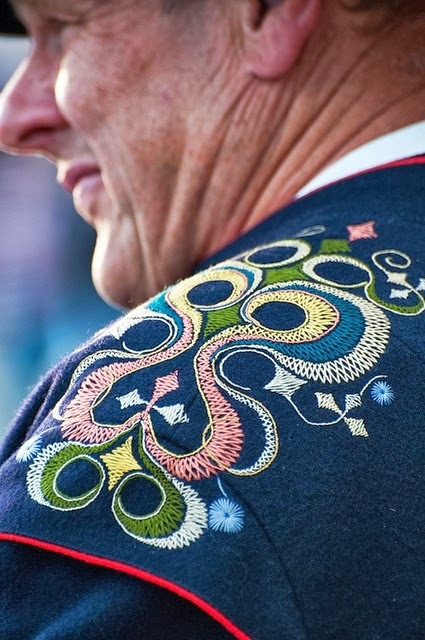 The designs are all similar, but vary in detail and color, older men tending to opt for less bright colors. 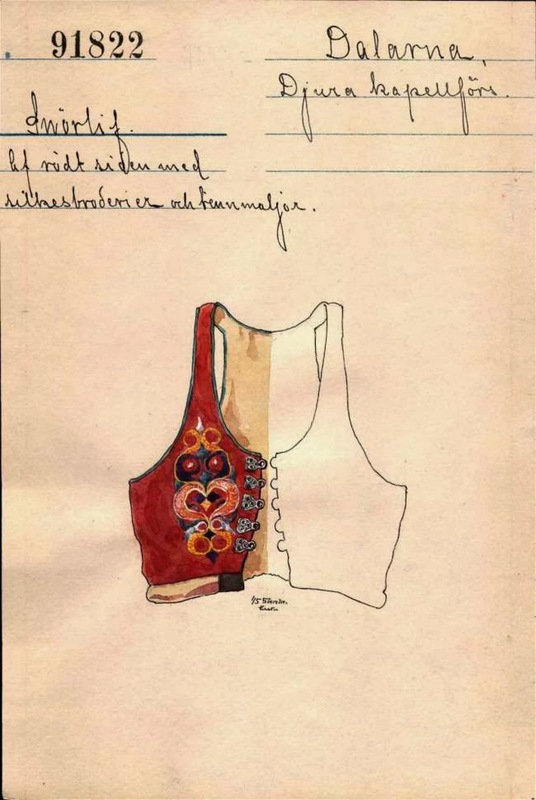 These are the same designs used on the women's bodices. 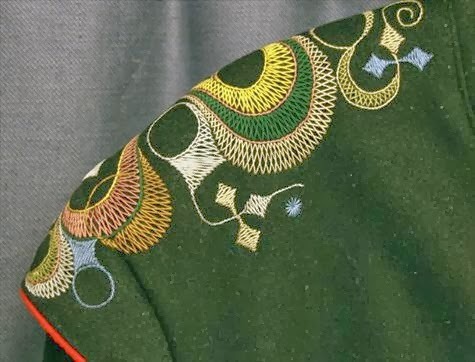 This first one is very strange in that the jacket seems to be green, but perhaps the color got shifted. 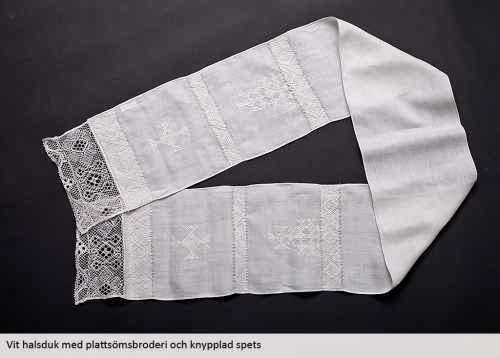 There is basically one stitch, in Swedish called flatsom, with occasional eyelets, and sometimes stem stitch for outlines and tendrils. 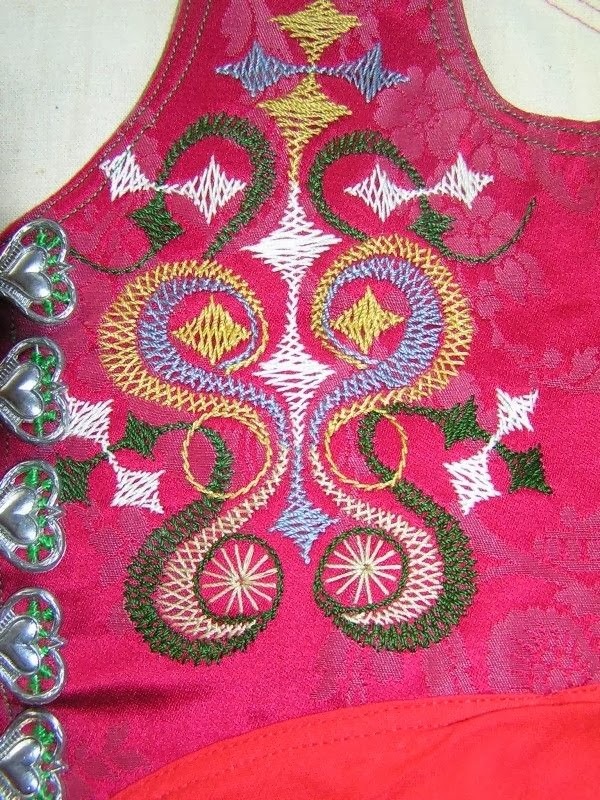 Compare the embroidery on the women's bodices. 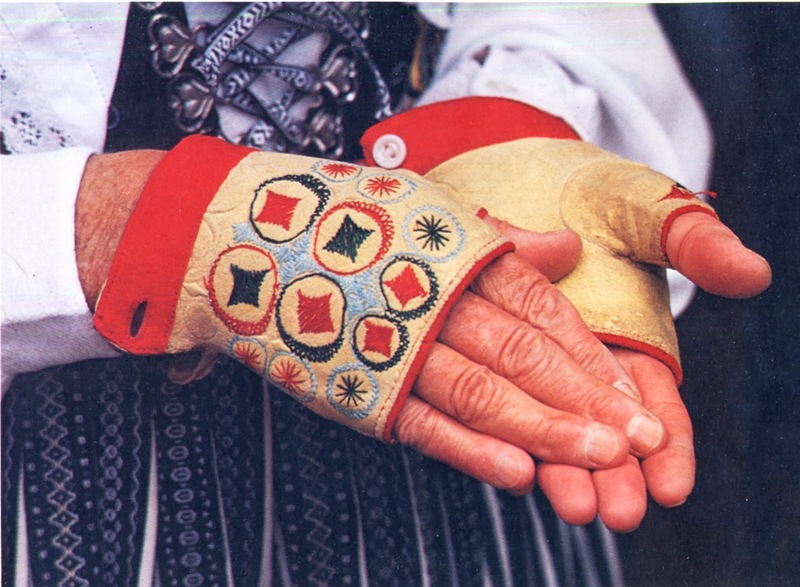 This type of Leksand embroidery is also used on the women's kidskin half-gloves, which are part of the ceremonial - wedding guest costume. Thank you for reading. I hope that you have found this interesting and informative. 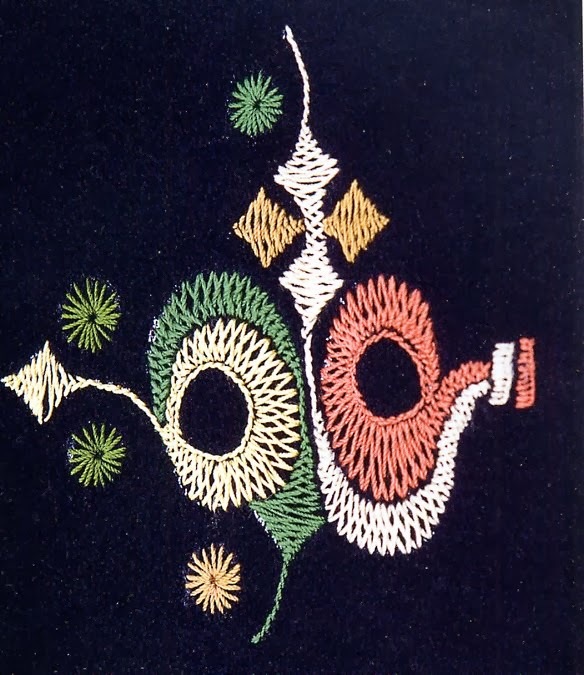 This unique style of embroidery would be useful for household projects, a runner or a pillow. 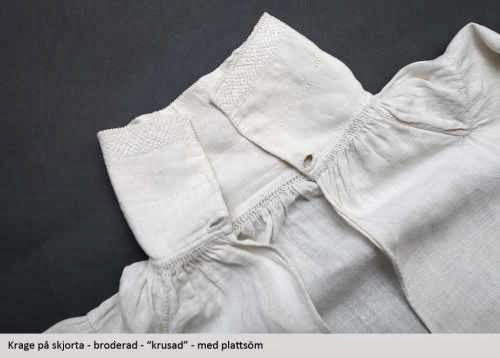 Bring a bit of old Sweden into your home. This is so beautiful! 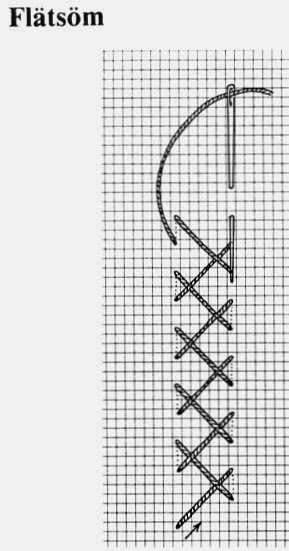 I do embroidery blogs myself and would like permission to use a small portion of this to introduce this to my readership. I will, of course, give you credit. Please let me know if that is acceptable for you and any other requirements. Have you ever considered putting all this info into a book? 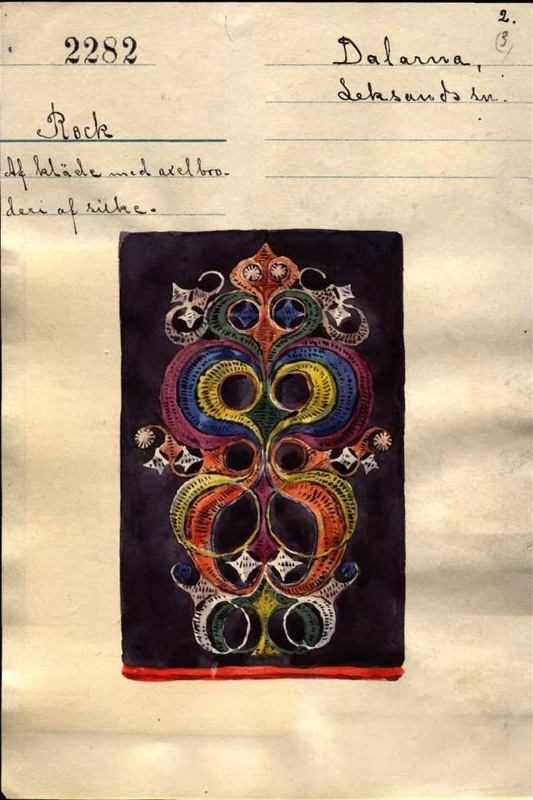 I would love to have a book like that. It would not be practical. Firstly, it would quickly turn into an encyclopedia. There is far too much for one book. Secondly, to publish a book would require getting copyright clearance for all of the photos. Hi! 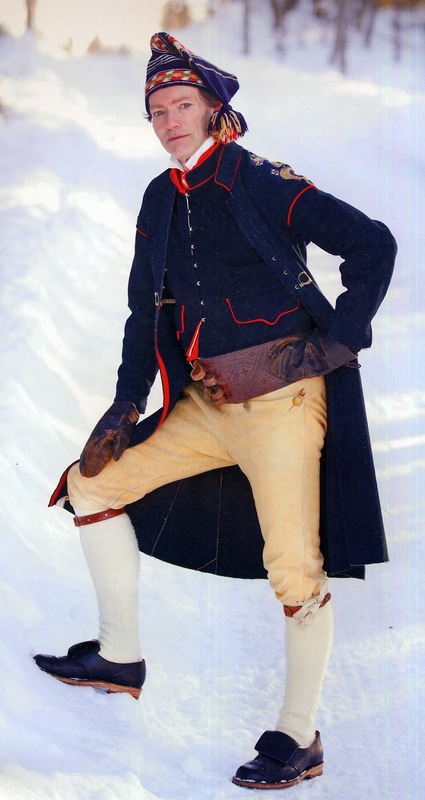 I am the one who made those gray woolen breeches. First I must tell you that their origin is not Mora. 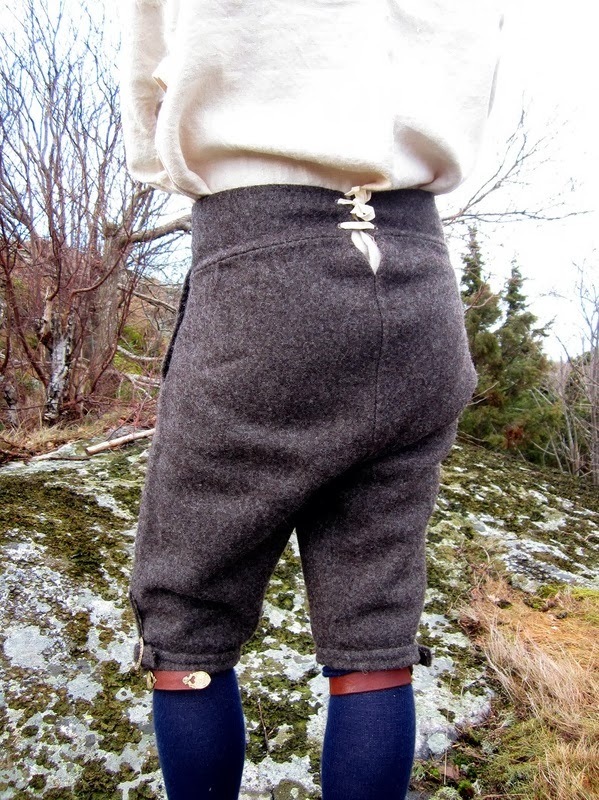 They are patterned from a pair och old breeches from southern part of Dalarna, but the original was not sewn in grey wool, such as these are. Second, I can not see a referens or link to the website where the pictures was published. Would you please link to that website (emmafrost.se) as well as the other sites you link to? And please ask before you steal pictures from other blogs next time. 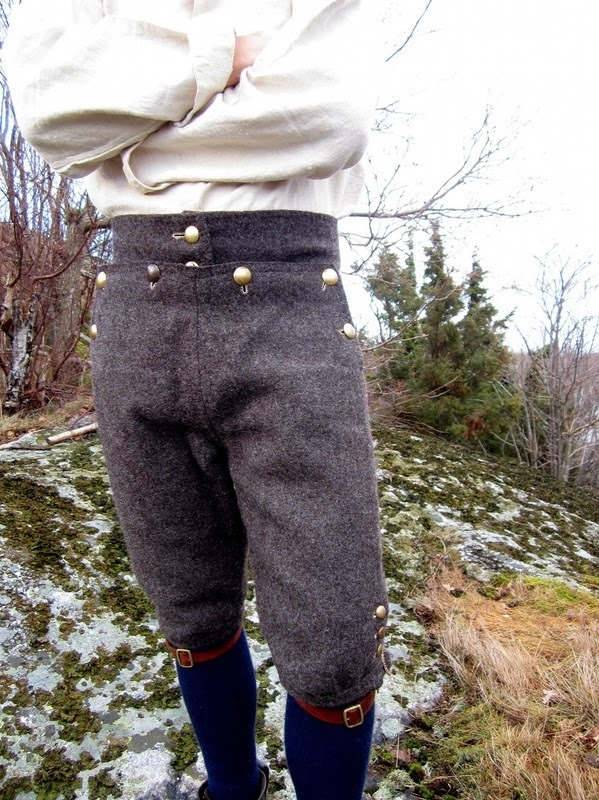 // The guy in the gray wollen breeches. I love your blog! I had to go back and look at all of the archives - what a tremendous amount of work your have put into this. Thank you so much for this effort. 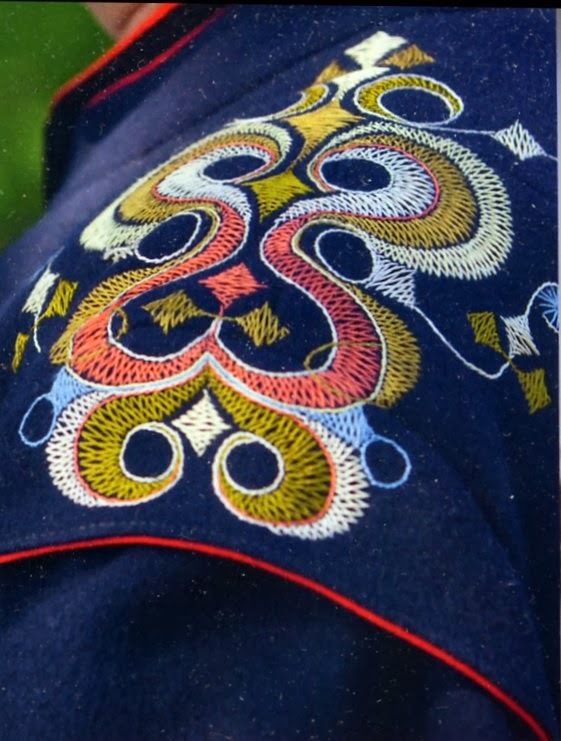 I have made Ukranian Eggs for 40 years and have always been fascinated by their designs and meanings, now I discover very similar looks in the embroidery - just beautiful. 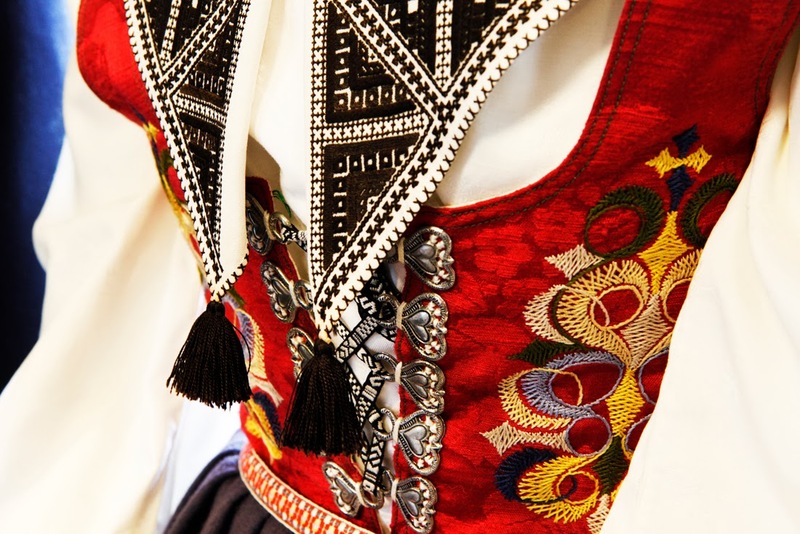 Awesome blog over here! Thanks for sharing this very useful information about the mens linen shirt.